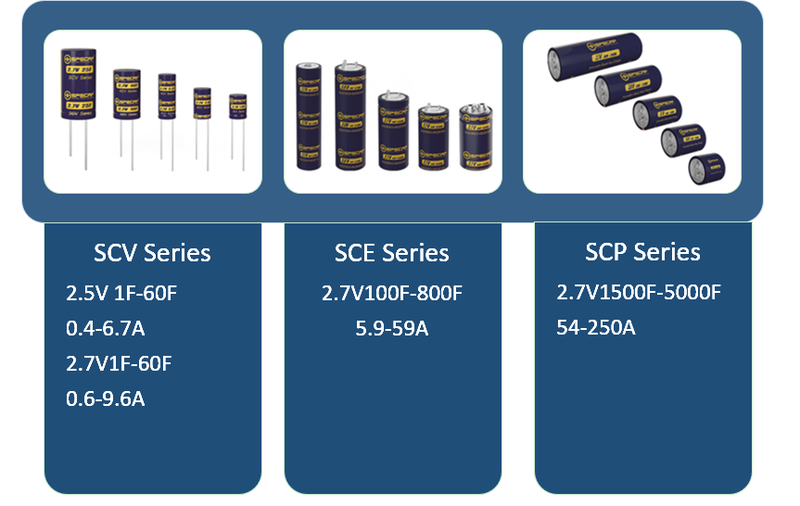 [Introduction] Nowadays, with numerous kinds of enegy storage options, it has been a main stream to use ultra capacitors along( farad capacitor ) with the characteristics of high power, large current, wide working temperature ranges, high safety, and long cycle life, or in combination with other energy storage products. So for the users, it is very important to select an appropriate ultra capacitor. Now let us learn more about ultra capacitor from the features of power, energy storage capacitance, environment and safety, etc. First of all, ultracapacitor is a capacitor, and it is unprecedented for the capacitor to reach farah grade. “Ultra” indicates that comparing with a normal capacitor, it has super energy storage capacity while maintains the super power characteristics. This new feature has made it possible for some applications, such as fast charging and fast discharging, fast charging and slow discharging( long discharge time), slow charging and fast discharging. ——Life: With over 1 million charging and discharging cycles, able to work for more than 10 years. 2.What are the applications of ultra capacitor? If you need a device of both high power and a certain level of capacitance to drive electric appliances, as well as maintenance free for a long period of time, able to work under a wide range of temperature, especially from -40℃~-30℃, when there is a strict requirement for safety. Then it is the right time for you to choose an appropriate ultra capacitor. ——Frequent acceleration (downward) or deceleration (upward) movement, such as in regenerative brake systems in auto. So what kind of ultra capacitor can meet your requirements? What are the critical parameters for ultra capacitor ? We will illustrate this using the ultra capacitor product system of SPS Technology as an example. The key parameters include voltage (V) , capacity (F) and rated current (A). In chosing an ultra capacitor for a specific application, there are several factors, such as power requirement, discharging time, and voltage variation should be considered. To make it simple, two types of parameters must be clear: 1) the range of working voltage; 2) power output value or duration of current output. For example：Vwork＝5V；Vmin＝4.2V；Working time t=10s；Current I＝100mA=0.1A, the capacitance is C.
So an ultracap of 5.5V1.5F is OK. So an ultra capacitance of 750V11F could meet the requirement. If after calculation, the desired capacitance is beyond the capacitance of a single cell, we could connect multiple ultracaps in series or parallel connection into a module, to satisfy customers’ specific needs. Many companies have launched the 2.85V and 3.0 V products. What are the advantages for high power ultra capacitor? ——Power and energy unchanged, by reducing the number of cells, the overall weight of the system could be reduced to optimize system design. For special applications, a simple voltage value is not enough. For example, at a temperature above 65 ℃, 2.5 V series products is a good choice. It is also notable that for all electrochemical components, environmental temperature will significantly affect the service life of ultra capacitors, and for every 10 ℃ decrease under high temperature environment, the service life of an ultra capacitor will be doubled. This article doesn’t discuss the structure and electrode materials for ultracapacitors, because non-quantitative parameters are not meaningful factors in selecting the right ultra capacitor. It is important to note that there is no universal energy storage components, the combined use of different kinds of energy storage device has become the best choice. At the same time, ultra capacitor is becoming the mainstream energy storage device while being used together with other kinds of energy storage devices to leverage their respective advantages.